Hatsune Miku isn't real, but her popularity is. The internet is such a big place that sometimes I stumble onto huge trends that I’ve never even heard of before. Case in point: Hatsune Miku. She’s a Japanese pop diva who’s just started to play massive stadium concerts to sold out crowds. Her hair is blue, she dresses like Sailor Moon, and she’ll only appear in concerts via a 3D ‘hologram’. Oh, and did I forget to mention that she’s completely fictional? Created by Crypton Future Media, Hatsune Miku is a virtual singing avatar that you can purchase for your PC and program to play any song you create. She and her virtual colleagues have gone on limited tours in Japan and virtual avatar song writing is a growing trend all over the world. Surprising? Perhaps, but the thing that really blows me away is that I actually like her songs. Check out Hatsune Miku’s performance of Stargazer in the video below. Not bad for JPop. In order to create a character that sounds believably human, Crypton uses a real person’s voice as the basis for the avatar’s distinct singing style. The adaptation of someone’s singing voice into a character that a user can program to sing anything has lead to controversy. Real musicians have been loathe to step forward and submit their voices for fear that they’ll be replaced by a virtual copy of themselves. Instead of professional singers, Crypton has hired cartoon voice actors to provide the basis for their avatars. Miku is reportedly created from the voice of Saki Fujita. The technology for Crypton’s Hatsune Miku program comes from Yamaha’s Vocaloid software which provides the means to create a realistic synthesized singing voice. You can hear samples of the raw Vocaloid synthesizer (which hasn’t been styled to fit any particular character like Hatsune Miku) on its website here. Miku and other avatars retail for ¥15,750 (~$193) and allow users to compose music and connect it to vocals note by note. You can share the songs you create via sites like Piapro (JP). Writing music for virtual avatars has become so popular that Crypton has established a music label, KarenT, and you can see many of the associated music videos for these songs on their YouTube channel. It’s hard to quantify how large of an impact Vocaloid software is having on popular music. Yamaha doesn’t directly market the software itself, instead relying on licensed developers like Crypton (in Japan) and Zero-G (in the UK) to sell various products based on the technology. There are many sites like Piapro where users can share their work, and many simply skip forums and go straight to YouTube. There are various blogs and sites dedicated to discussing the Vocaloid phenomenon (I recommend you start with Vocaloidism), and there are karoake and music-composing video games featuring some of the most popular avatars. It seems clear that virtual characters like Hatsune Miku are on the upward swing of their popularity. Crypton’s avatars have played several live concerts in the past year. Miku’s first ‘solo’ performance took place on March 9th, and was titled Miku no Hi Kanshasai 39’s Giving Day – this is where the Stargazer performance was recorded. DVD and Blu-ray copies of the performance are set to be released globally, and there have been screenings of the concert in San Francisco and New York. 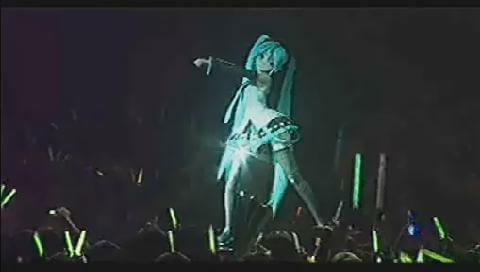 The tour coincides with the release of the Hatsune Miku Project Diva video game from Sega. Having just been introduced to the Vocaloid scene, I’m sort of in awe. Not by the quality of music – some of it is good, but mostly it’s pretty generic mainstream stuff. No, I’m impressed by the possibilities created by such virtual avatars. YouTube is already full of videos where users mix and match songs to various pieces of art, and remixing/sampling is a global music phenomenon. Now, these secondary source musicians have a whole other tool in their belt. They can have high quality virtual characters sing whatever they want. Modern technology is merging producers and consumers of art into a new being – the prosumer. Avatars like Hatsune Miku are accelerating that process, allowing us to generate more quality content on our own, and share that content with anyone via the web. In the future we will all be a part of this exchange of creative prosumerism. Ask not for whom the 3D hologram pop star sings – it sings for thee.